For other uses, see Zebedee (disambiguation). 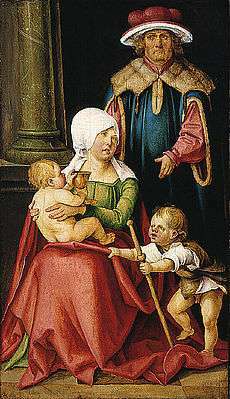 Hans von Kulmbach, Mary Salome and Zebedee with their Sons James the Greater and John the Evangelist, c. 1511. Zebedee (Greek: Ζεβεδαῖος, Zebedaios, Greek word #2199 in Strong's; Hebrew: זְבַדְיָה‎‎, Zvad'yah, Hebrew word #2069 in Strong's Concordance), according to all four Canonical gospels, was the father of James and John, two disciples of Jesus. The gospels also suggest that he was the husband of Salome: whereas Mark 15:40 names the women present at the crucifixion as "Mary Magdalene, and Mary the mother of James the Less and of Joses, and Salome", the parallel passage in Matthew 27:56 has "Mary Magdalene, and Mary the mother of James and Joses, and the mother of Zebedee's children." The Catholic Encyclopedia concludes that the Salome of Mark 15:40 is probably identical with the mother of the sons of Zebedee in Matthew. Zebedee was presumably a fisherman, "probably of some means." Although named several times in the gospels, the only times he actually appears are in Matthew 4:21-22 and Mark 1:19-20, where he is left in the boat after Jesus called James and John. Mark noting that Zebedee was left with the "hired men" and Gospel of Luke 5:4 noting two boats imply the family had some wealth. Zebedee lived at or near Bethsaida. John 18:15 ("Simon Peter and another disciple were following Jesus. Because this disciple was known to the high priest..."). The name given in the Gospels, Greek: Ζεβεδαῖος, is probably a transliteration of the Hebrew name Zebadiah according to Spiros Zodhiates (The Complete Wordstudy Dictionary), or the truncated version Zabdi, says BDB Theological Dictionary, and so means Yahweh (or The Lord) Has Bestowed. Other popular interpretations of the name are: abundant (Hitchcock's Bible Names Dictionary) or my gift (Smith's Bible Dictionary). 1 2 "Zebedee", J. D. Douglas (ed. ), The New Bible Dictionary (London: The Inter-Varsity Fellowship, 1963), 1354. ↑ "Zebedee". Retrieved 13 April 2015. ↑ "Zebedee meaning". Retrieved 13 April 2015. ↑ "Topic Bible: Zebedee". Retrieved 13 April 2015.